The Mount is an exceptional Devon house in Kingswear with views out to the River Dart and Dartmouth Castle. The original property was built at the end of the 19th century and exists as a fine example of the period. Having been converted to two flats at one point, the house is one residence again and boasts magnificent modern interiors which fit comfortably inside the exterior of the Victorian villa. All the rooms are tall and have large, light windows and a simple colour scheme, which is paired with limestone or slate floors in the passageways and natural wood in the main reception rooms. These comprise the study, drawing room, sitting room and the conservatory/dining room, which links to the kitchen/breakfast room, which in turn leads out to the terrace via French windows. Upstairs the first floor houses the master bedroom suite, two further bedrooms and a bathroom and shower room, whilst the second floor has three further bedrooms, a bathroom and a shower room. Outside a graveled parking area includes integral garages and ample parking. 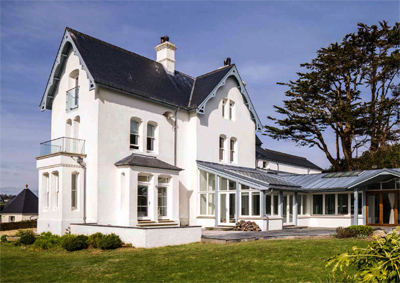 The gardens have been landscaped and include extensive terracing, which makes the most of the far-reaching views out to the River Dart and the estuary; the house faces south and west. Kingswear itself sits on the east bank of the River Dart, opposite the town of Dartmouth. The village has a shop and a post office, while Dartmouth has extensive amenities, and can be reached by ferry. Torquay is around seven miles to the west. The guide price is £2m. For further information please contact Savills on 01392 455 700 or visit www.savills.co.uk.